Give your castings the look and feel of marble, wood, or metal with ArtMolds powders. White Marble Powder — Mix with ArtMolds CastRite to create a luminous simulated marble finish on lifecasting art and more. Polishing the finished work with several coats of wax will add to its luster and render a just-carved look. Pecan Shell Powder — This lightweight powder is used to make resins lighter, thicker, and more sandable, and give molded pieces the appearance of wood. Combine it with epoxy, vinyl ester, polyester, or polyurethane resins for making fillets or filling wood. It also can be used for rebuilding rotten or termite-damaged wood. Pure Bronze Metal Powder — This powder is a fine grade of 325 mesh, the ideal degree of fineness for cold casting. 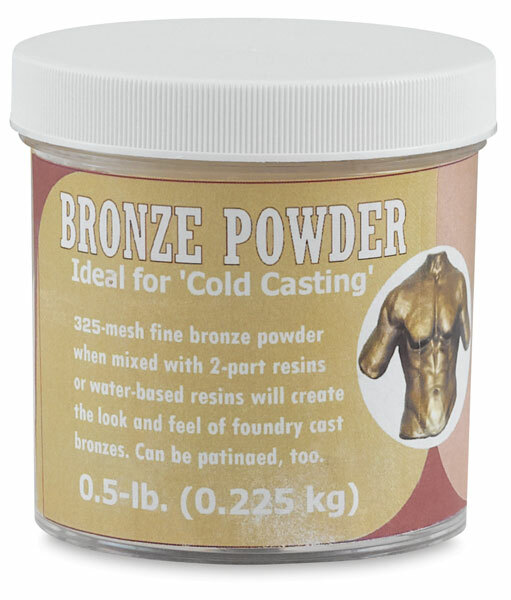 Add it to polyester or polyurethane resin, epoxy, gypsum cement, or other binders to create the authentic look and feel of a hot metal foundry casting. Following abrading and/or burnishing, the finished piece can be patinated or allowed to naturally oxidize for an antique look.